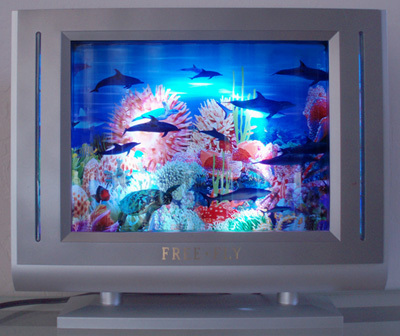 Experience the beauty and elegance of this TV Style Dolphin Motion Lamp. When you turn on the switch, it gives you the illusion of watching a school of dolphins and sea turtles swimming under the beautiful ocean. It also makes a great night-light. You can put it on a desk or hang it on the wall. It will bring you and your family a lifetime of pleasure. 16" W. x 13.5" H. x 3" D.